If you know me you know I'm all about the glow. I love a popping highlight bright enough to be seen from the other side of the country. I have a small bundle of highlighters, some I use everyday and some I use very rarely. 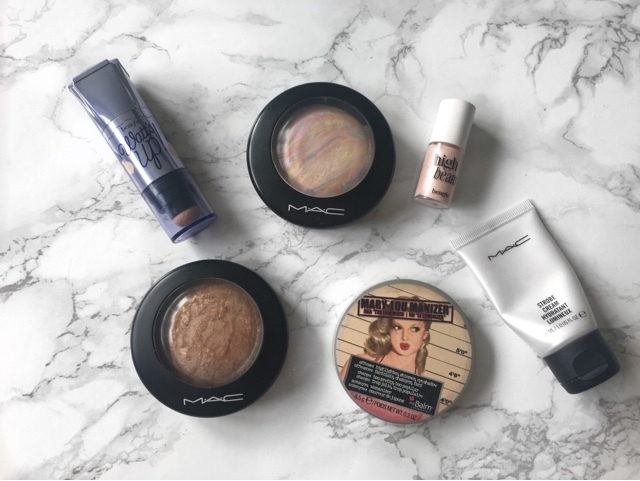 From left to right the products are (Benefit Watts Up, MAC Strobe Cream, Benefit High Beam, MAC Mineralise Skinfinish in Lightscapade, theBalm Mary-Lou Manizer and MAC Mineralise Skinfinish in Global Glow). Benefit Watts Up. This is a cream highlighter. Whenever I want a super strong highlight after I've applied my foundation I take this on my middle finger and tap it on the areas where I would usually apply a powder highlighter (tops of the cheekbones, tip of the nose, cupids bow) and then set it with a powder highlighter. I find that this creates a more intense highlight as it is using a cream and a powder highlight. It's important not to use the cream product when you've already set your foundation as the product will not blend properly and will look cakey. MAC Strobe Cream. I'll not go into detail too much about this one as I did talk about it in my last post. However, I love using this under my foundation to make my skin look more radiant. Benefit High Beam. I've never actually owned this as a full sized product I've always had samples of it or a minature and to be honest I don't think I use it enough to buy the full sized. I don't really favour pink toned highlighters however I do sometimes mix this with my foundation in the spring time just to give my foundation a bit of radiance. MAC Mineralise Skinfinish in Lightscapade. This was the first powder highlighter I bought and I used to use it day in day out. However, I don't tend to reach for it as much any more as I do think it is a little too light for me now. 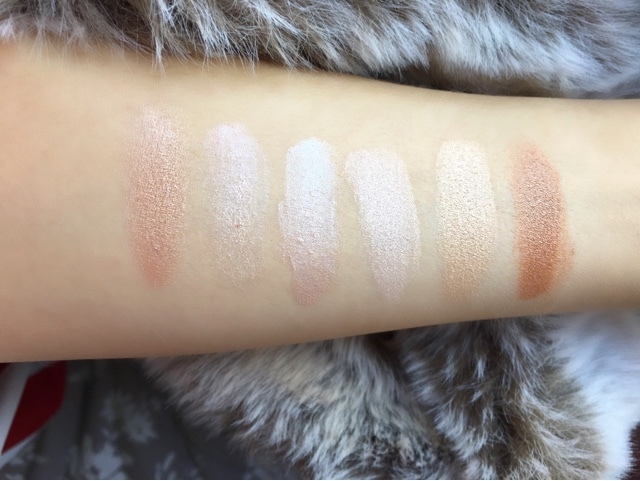 But it's perfect for paler skin tones! theBalm Mary-Lou Manizer. My holy grail. My baby. This has been my favourite highlighter for over a year now and I've used it pretty much everyday and I'm still on my first batch. This is the most beautiful, intense, champagne, popping highlight and I have no words to say other than you need this. MAC Mineralise Skinfinish in Global Glow. This is a lot deeper than the rest of my highlighters but I love mixing it with the Mary-Lou Manizer just to create a more bronzed highlight. It's also great used on its own, lightly dusted on my temples on top of my bronzer on those days where I want a bronzed glow. I wouldn't recommend this to people with paler skintones as it could look quite muddy. That wraps up my little bundle of happiness that of course is - highlighters! Let me know what your favourite highlighting/strobing products are! See you soon! Rebecca Olivia Capel, 21 year old UK beauty blogger and fully qualified makeup artist. © REBECCA OLIVIA CAPEL | All rights reserved.